Teach about kitchen safety? 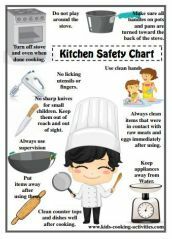 Who doesn’t need a visual reminder from time to time of how to be safe in the kitchen, especially when working with younger students? This chart was created and shared by Debbie Madson from Virginia. These basic guidelines can be used to go over kitchen rules and how to be safe in the kitchen at the beginning of a kitchen safety unit or lesson. Teachers can print, laminate and hang the chart in each kitchen lab and students can refer to it as needed. Check out Debbie’s website for more kids cooking activities.